Based on a process developed by the Center for Motivation and Change. The best place to find positive, evidence-based support for a loved one battling addiction. Here you’ll find cutting edge information about treatments for substance use disorders and proven therapy in a free first-of-its-kind online toolkit. 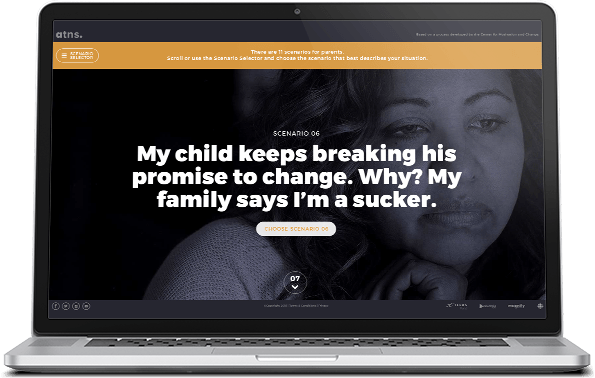 This interactive guide teaches vital survival skills to families struggling with substance use. Learn new ways of communicating with the user, how to diminish family conflict, how to re-charge yourself. Best of all, it’s free and available 24/7. As researchers develop greater understanding of how substance use alters the brain, they have created medications proven to diminish cravings, reduce agitation and improve sleep. Wasted: An Alcoholic Therapist's Fight For Recovery in a Flawed Treatment System. A revolution in addiction research offers hope to those whose lives are Wasted by addiction. Evidence-based research and resources to help you help your loved one. Sign up for our newsletter, where we’ll keep you up-to-date on all the latest in the world of compassionate, evidence-based treatment for addiction.